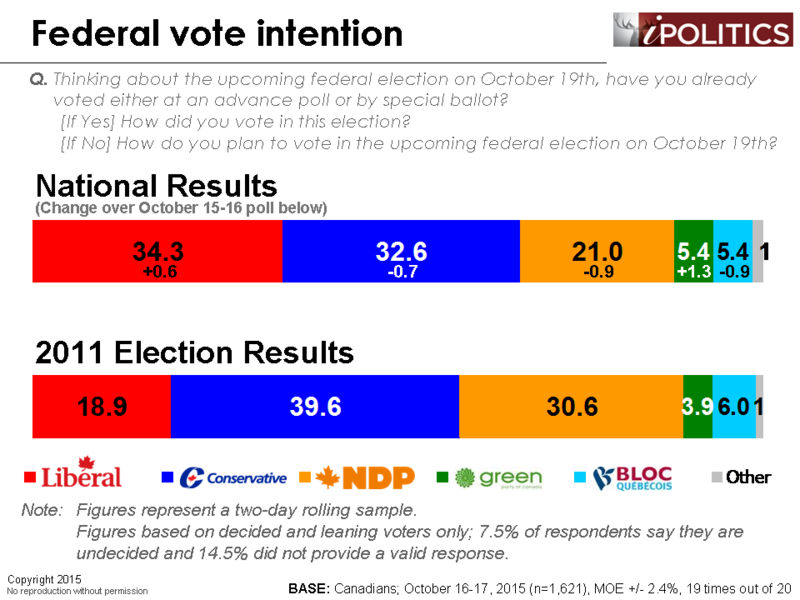 [Ottawa – October 18, 2015] With less than 24 hours to go until the polls open, it appears as though vote intentions are relatively fixed, although the Liberals may be opening up a bit of headroom. At 34.3 points, the Liberals hold a statistically insignificant lead over the Conservatives, who are at 32.6 per cent. The NDP is at 21 points and there are no signs of any last minute shifts. Quebec has transitioned into an unclear four-way race. With just a seven-point spread separating the NDP, the Bloc, the Liberals, and the Conservatives, there are no guarantees as to what will happen tomorrow. We can certify the Liberals’ Ontario lead as significant and stable and providing a very significant seat premium for them here. British Columbia, as always, remains confusing to the pollster and we see an unusual Conservative lead (which may well be a random artefact). 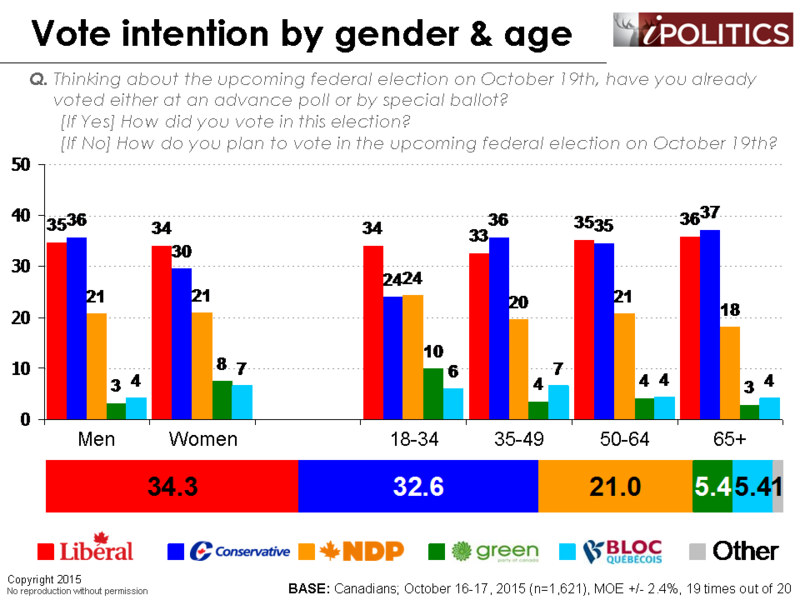 It is also worth noting that the Conservatives’ advantage with seniors has evaporated. We would express some scepticism on this, although it is entirely possible that the Liberals have pulled into a tie with the Conservatives here, as the gap has narrowed significantly over the past week. If this shift is indeed real, this would be very positive news for the Liberals in terms of turnout. We’ll be putting out a final set of numbers later this evening. We’re weighing and balancing a few things in preparing for our final release. These include the final day numbers, as well as some modest mode effects across live interviewer and IVR. We will make our final prediction later today. The figures in this report are based on a two-day rolling sample. Each day, a new day’s worth of interviewing is added and the oldest day is dropped. The field dates for this survey are October 16-17, 2015. In total, a random sample of 1,621 Canadian adults aged 18 and over responded to the survey (1,158 by HD-IVR, 463 by live interviewer). The margin of error associated with the total sample is +/- 2.4 percentage points, 19 times out of 20. Cons 41% in BC… just 4 less than 2011. And their numbers in Ontario and Quebec, where most the votes are? Ekos is the only polling company which shows the Libs and the Cons in such a close race. If what they say is true regarding the seniors vote (Cons lead has evaporated), I don’t think it will be close tomorrow. Harper is toast. Even if his party somehow wins a minority of seats, they will not get the confidence of the House. Trudeau is going to be the next Prime Minister (NDP backing the Libs). I think Mulcair is finished as well. NDP ran a lousy campaign (and I really believe that it started with their refusal to participate in the all-networks debate, because Harper wasn’t going to go……………Mulcair could have scored some big points with the Canadian voter, debating Trudeau, May, Duceppe, and an empty blue podium, in front of millions of voters, watching on television and online. The NDP’s reasoning that they were the only ones able to defeat Harper,…. so they were going where he was going (into Conservative-chosen debates), now looks foolish. All political parties need to rejuvenate themselves, after an election cycle or two……..I think the Conservatives and the NDP will be doing just that, after tomorrow. So you are saying that there is a possibility of a Con minority ? Sure….could be. The Cons do not have the support of any other party. Conservatives winning a few more seats than the Libs equals a Lib/NDP coalition (with Elizabeth May brought on board to pacify the Greens). I gave no opinion on the outcome. But yes, a Conservative minority is possible. It’s going to come down to turnout and the efficiency of that vote. Is the “Shy Tory” theory more than just a theory ? Will soft/medium Liberals look at the polls and think it’s going to be a Liberal win and think their vote isn’t needed? Will soft Conservative voters look at the polls and think it’s going to be a Liberal win and stay home? Do the 18 to 34 year olds actually show up? Lots and lots of variables. The angus numbers you included below are for ELIGIBLE voters. The numbers I quoted are for LIKELY voters. A new IPSOS REID POLL give the LIBS a 7 point lead and does NANOS. You can’t just pick the polls that you like and the ones you don’t. The CBC’s poll tracker which takes ALL polls into account has the LIBS in the lead by 6 points. Simply pointing out another pollster got similar numbers to EKOS as the OP said nobody else had those results. You are reading farther into the numbers to find a scenario which suits your opinion. I would not put too much trust in threehundredeight as an aggregate. The reason is that it gives a weighting to Nanos in excess of 50% – so it is just basic a reflection of Nanos tempered a little bit by the other polling companies. I am disbelief looking at the Ontario numbers. While Wynne is on the verge of bankrupting the province people will vote for her soul mate. Atlantic Canada is no surprise, they will vote for anybody that promises to give them stuff. In the end the Liberals won’t create six jobs here but once again to gullible have to believe in something. And how about Harper campaigning with the Ford brothers, that sounds like an equal liability for any political party considering Ford’s history especially during his mayoral tenure. The Conservatives were supposed to be the law-and-order party, but the last person you would have support is Rob Ford and its crack-cocaine scandal as well as his various behavioral rants. You are missing the point. Wynne is not very popular in Ontario. The only reason the Libs got in, here, was because of the pathetic campaign run by Tim Hudak, and the Cons, in the last provincial election…… Not just my opinion……The PC interim leader (Jim Wilson) told reporters, after the election, that they (PC party) had shot themselves in the foot with Hudak’s campaign pledge to cut 100,000 jobs, slash taxes, and cancel tax credits for students and seniors. He said that Hudak thrust this upon the PC caucus with no consultation. It was the third election, in a row, that the P.C.’s had snatched defeat from the jaws of victory. I hardly know anyone that wanted a Wynne majority. Cons supporters seem to think that Ontarions are stupid because a portion of them supported the Libs……..I think that most Ontarions just couldn’t vote for a campaign that made no sense. My point is that folks like you, who are lumping Wynne and Trudeau together to try and get some boost for Con fortunes, don’t seem to understand that Harper is disliked by the vast majority of Canadians and a lot of these folks are voting for whichever party they think can take him down. It’s not just a Lib thing. i’d say you’ve got a last minute bloc surge, there. forum is picking it up as well. nanos has….let’s call it a bump rather than a surge. i would agree with anybody suggesting that you can’t honestly separate it from possible sampling error, but the thing is that i think this makes sense. with the ndp down a large chunk as it is, a lot of what’s left are going to be scrambling to find ways to make sure neither the conservatives nor the liberals (who are nearly equally despised in much of quebec) can win in their riding. with those numbers, i think it’s clear that the bloc win a lot of seats. i don’t think a late swing to the conservatives in bc is unbelievable, either. but nobody else is picking it up yet. and, you have to ask “where?”, too, and “from who?”. i’m skeptical about a swing in the lower mainland. rather. what i’m willing to believe here is maybe counter-intuitive. outside of the lower mainland, the haunting sceptre of a liberal minority, even, could be enough to firm up traditional conservatives that were leaning ndp on the perception they had a chance of forming government. most of bc is going to vote on a populist/elitist axis, which makes the liberals broadly uncompetitive. it’s the one place in the country where you’ll get ndp voters voting strategically for the conservatives, just because the spectrum is completely different. nanos *does* have the ndp down and the conservatives up a bit relative to last week, but it’s the same thing with sampling and margins. i’m not overwhelmingly skeptical, anyways. it was maybe hard to believe they were down 15-20 points. it’s clearly the uncertainty in bc and quebec that are warping your numbers. i’m still leaning towards it being a consequence, or artifact, of the method. but these have been trouble points for pollsters recently, too. really: you’re not telling me anything absurd, right now. i’m just left with same concerns regarding the question of what are truly reasonable sampling frames. BC numbers just don’t make sense (though at least you corrected the absurd high numbers for the Green Party), especially since the Conservatives are not faring well at all in Vancouver as well as much of Vancouver Island. And EKOS also joins the others regarding the 65+ vote – meaning it is a tight race for that age group now – which of course equals more bad news for Stephen Harper. I do find the Liberal numbers quite low in Alberta, with many other pollsters have them around 25 to even above 30. 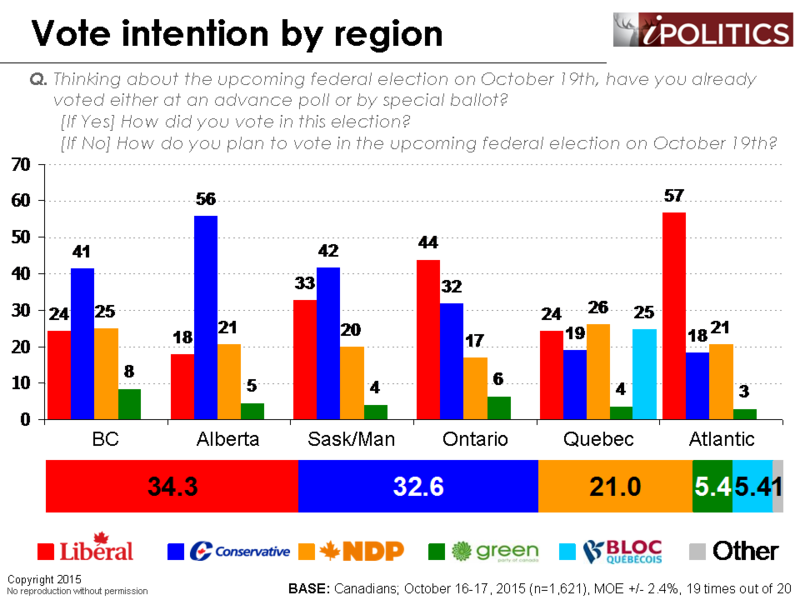 Some goes in Quebec and BC, where many pollsters have the Liberals around 30 or more. EKOS has one last shot to catch on to the other pollsters, if not, it might be an embarrassment much like in 2011. If those BC nu bersurn out to be true then Turdeau is in trouble. The Conservatives will win a minority. Although the Liberals lead in Ontario, much of their margin comes from ridings where they will win by a landslide. It is actually a wasted vote that will not necessarily translate a lot more seats. The pollsters also have a habit (deliberate?) of underestimating the Conservative vote and slightly inflating the Liberal numbers as election day approaches. The contest is going to be much tighter than the Liberal cheerleaders would have us believe. Don’t get your pom-poms out yet, Justinettes! i’ve been posting photos of the 2014 ontario election for comparison, but the numbers have stabilized higher than that – closer to the 2004 federal election. this is a very different map than the models are producing, but i suspect it will be closer to the final outcome. If the Conservatives do, indeed, win a minority as you are speculating……..Trudeau will still end up as PM. The Libs, NDP, Bloc, and Greens have all said that they will not support a Harper minority. The Libs will give the NDP something in exchange for their support. Considering that the Libs/NDP vote will be well over 50% of the total vote, I would think that most people would be fine with a coalition made up of those two parties (and their are a lot of polls supporting that statement). I realize that the Con vote will be upset, but almost every pollster has said that the majority of Canadians want change……..meaning the majority of Canadians do not want Harper. Majority rules. Yes, they will not support a HARPER minority, not they won’t support a CONSERVATIVE minority. If Harper steps down, then what?? If Harper steps down, the other parties will still not support the Cons. The Libs and NDP will have well over 50% of the vote (probably closer to 60%) and I bet the Governor-General will ask them if they can form a coalition government If the Libs and NDP put something in writing (as Peterson -Lib and Rae-NDP did in Ontario in 1985) regarding a set timeline for cooperation (ie: 2 or 3 years), I bet they will be allowed to form the government. You are assuming parliament comes back this year. The CPC could delay bringing the parliament back in session util after what would have been Christmas break in late February early March with a new leader/PM, have a Throne Speech, as Liberal strategist Warren Kinsella suggested, dealing entirely and only with TPP. NDP vote it down, what do the Liberals do? @Graham – if Harper tries to hang on to power by not calling the parliament back for some absurd amount of time after failing to get a majority, I expect the NDP and Liberals to form some sort of alliance, go to the GG, and demand that he instruct the PM to either recall parliament or resign. The GG has the power to fire the PM. Harper can play all the games he wants at that point. With 60% of the electorate voting for not-PC they have a lot of moral leverage. King/Byng will look like a playground argument in comparison. Only because of a pathetic campaign run by Tim Hudak. Jim Wilson, the interim leader after Hudak, said they shot themselves in the foot with their poor campaign. Why would the mostly Conservative leading sponsored polls like NANOS [Globe & Mail & CTV] and a poll sponsored by POST MEDIA [SUN] inflate the LIBERAL’S numbers??? Those are hardly left wing organizations. The CBC does not sponsor any of the polls. The only left leaning sponsored poll is FORUM which is sponsored by the Toronto Star. 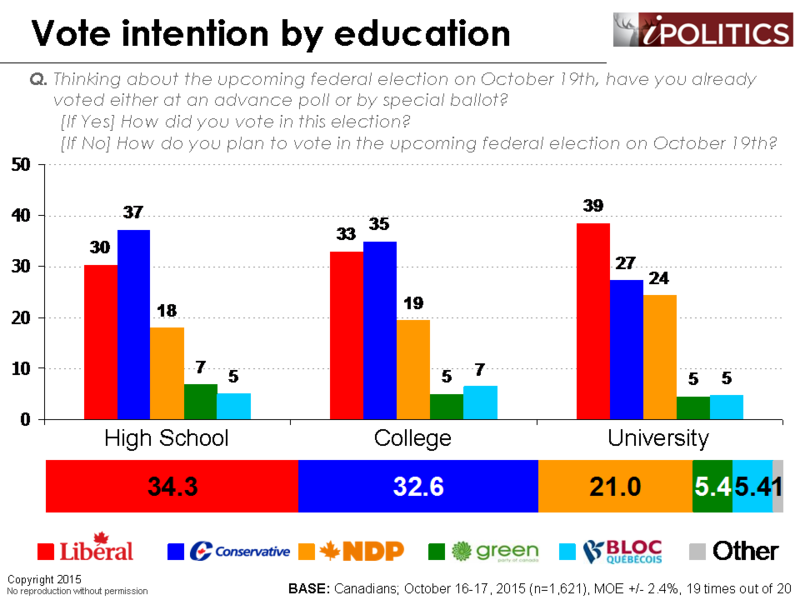 If HARPER is losing in right wing leaning sponsored polls HARPER is in big trouble. Also what the polls don’t show you is how 71,000 students voted at their schools or how FN peoples are voting in 51 Ridings? Regan, just relax and take a deep breath. Most of the people here are trying to have a more academic discussion about the polls, not try to spin them. Just an addition to your point……..The Ipsos poll out this afternoon (Libs – 38, Cons – 31, NDP – 22) was commissioned by Global news (if you ever watch Global’s political coverage, you would know that they are no friends to either the Libs or the NDP). They are so confident in their numbers, that they are proclaiming Justin Trudeau as the next PM (making him part of a Father/Son team that will be the first to be voted in as Canadian Prime Ministers). Lisa laFlamme, Bob Fife and Don Martin of CTV are about if not more rabidly anti-Conservative as the CBC. Looks like EKOS will miss big just like in 2011. IF WE RETURN TO DEFECEIT FINANCING LIKE TRUDEAU WANTS TO DO, THEN OUR STANDARD OF LIVING WILL DROP IN THE FUTURE, TAXES WILL GO UP AND THEIR WILL BE MORE GOVERNMENT CUTBACKS IN THE FUTURE. DEBT IS THE REASON EUROPE IS IMPLODING. SO WAKE UP CANADA AND VOTE FOR A REAL PARTY THAT IS FISCALLY RESPONSIBLE, AND THAT IS THE CONSERVTIVES. I THINK THAT THE MEDIA PLAYS A HUGE ROLL IN POLITICS AND THEY ARE MOSTLY LEFT WING SO THAT DOES NOT HELP CANADA, IT HURTS CANADA.THE CONSERVATIVES NEVER REALLY HAD A FAIR SHAKE FROM THE MEDIA FROM DAY ONE. Yeah…….those nasty left wingers at the Sun, National Post (and any other media outlet run by Postmedia),Globe and Mail, and Global News, just don’t give those poor Conservatives a fair shake. Jason Kenney (former Immigration Minister….now Defence Minister) has said repeatedly that the Cons increased immigration by 14% over the previous Liberal government. Harper said, two weeks ago that the Cons have actually increased immigration and are bringing in 250,000 a year.I guess they are not as informed as you are. NO PARTY HAS BEEN MORE CORRUPT THAN THE LIBERALS, WHAT ABOUT THE 2 BILLION DOLLARS THEY TOOK FROM CANADIAN TAXPAYERS AND NO ONE WENT TO JAIL FOR IT, AND NOW WE ARE PAYING FOR THEIR FAT PENSIONS. I find all this spin interesting.here are a few example that could rattle cages. 2. Mr Harper has made it very clear how he feels about Immigrants..All Immigrants. Since at a rough guess about 65-70% of Canadians started off as immigrants in the last 80 years..He just made all of these people second class Canadians…Now he would like their vote..Now that is rich. 3. Old PCs..Many shy voters, who do vote but most fit into a category veterans, Immigrant Canadians and older citizens who prefer a gentler verbiage. They are not impressed by nasty demeaning comments. It is not their way but they are paying attention. What kind of country do they want their children/grandchildren to inherit. These people have been the backbone of hard workers. 4. I have not mentioned yet Duffy, Nigel Wright and the children in short pants running the PMO. No Battleships, No Planes for the Military. No respect for the Supreme Court, No Investigation for missing Women, Omnibus Bills, Defunding for Science, Waterways, Election Reform, 3.2 Missing Billions. Shift in Foreign Policy, Standing in the World, Deficits and one scandal after another. Could write a book on this. 5. We may be old but we are paying attention. 6. I would not take bets on how any of this will shake out but one thing I am sure. This is not going to be business as usual. 7. This is not about us. This is about the Country we all love and its future. We are a young country with a bright future and it needs looking after long term..This is not a game how, this is Real Life. So maybe everybody has to think about the Whole Country and ALL our peoples. Just some food for thought.